Safe-Decho cabinet is made of P2 class MDF board environmental material ,use safe and comfortable. Security System-One key locks all three drawers. Dimension:50cm (D)*41.3cm (W)*62 cm(include the wheels)(H)/19.7"x16.3"x24.4"
Decho furniture only provide high quality product .Each product would be through crash testing before arrange delivery to avoid damage. 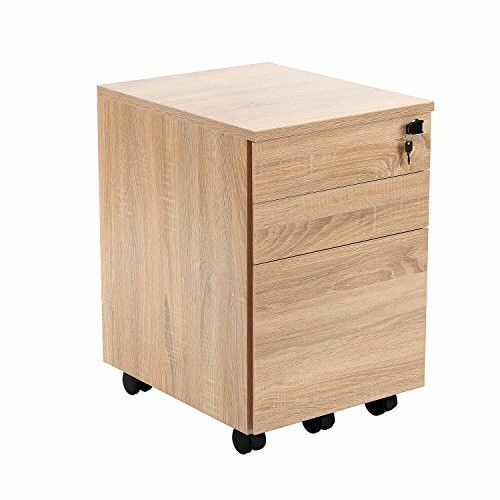 [DECHO DESIGN]-DECHO 3 Drawer Wood File Cabinet suitable for home and office use. [Material]- Made of Melamine and P2 Class MDF Board, Nylon. [Super Long Assurance]-We provide super long 24 months quality assurance only to "decho" product will bring you more pleasure. If you have any questions about this product by DECHO DESIGN, contact us by completing and submitting the form below. If you are looking for a specif part number, please include it with your message.